Seven years later and Jojo and Dio are now close friends. Or at least so it seems to others. On the inside Jojo knows that the friendship is not true, while Dio revels in his deceit of everyone, while preparing to take control of the Joestar estate. 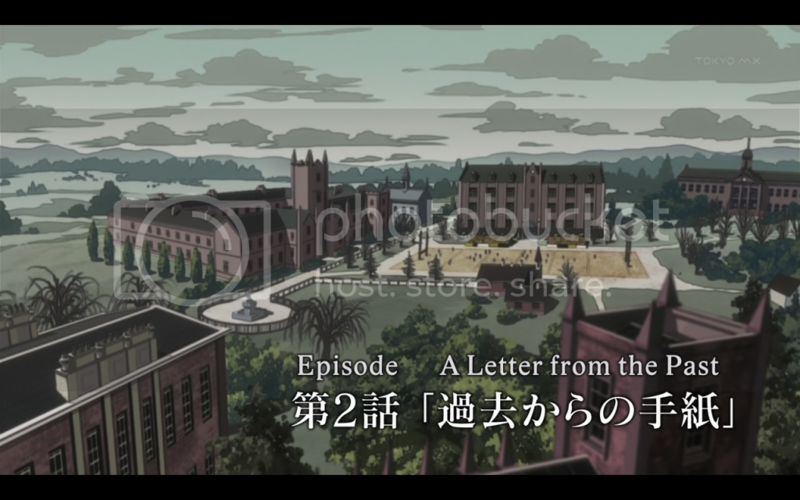 Lord Joestar has fallen ill, and while getting a book from the library for his research on the stone mask, Jojo comes across a letter describing the symptoms Dio’s father suffered before his death. From this he suspects that Dio killed his father, and was in the process of killing Lord Joestar. 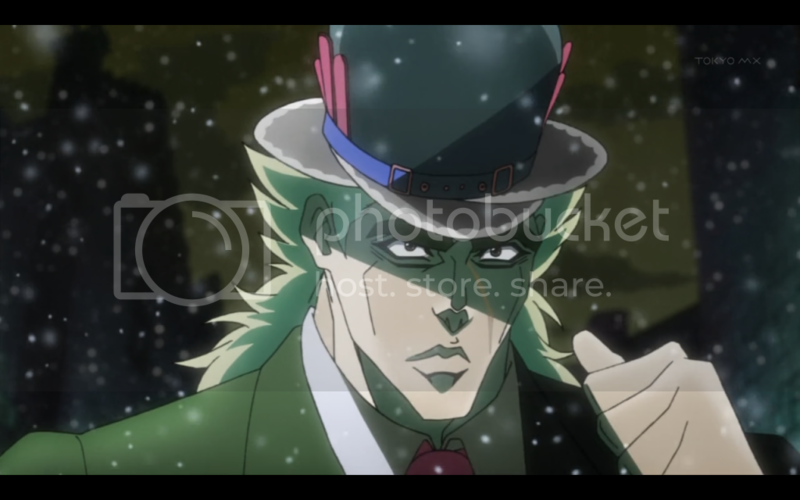 When he confronts Dio about this, Dio tries to use his control over Jojo, but gives away that he has been switching the medicine for poison. Jojo takes the poison to London, to have it analyzed. He goes to a rough part of town, where he intends to find an oriental apothecary that can tell him what the poison is. He runs afoul the residents of Ogre Street, but his prowess and nobility gain the admiration of Speedwagon, who helps him find the apothecary. 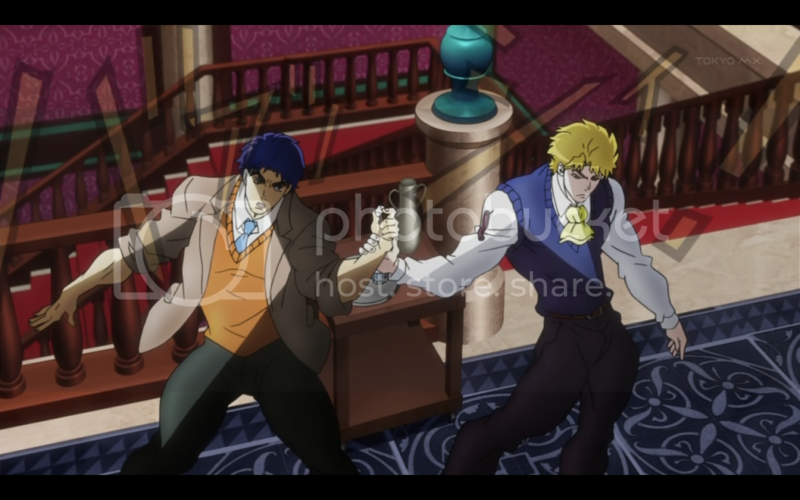 Dio falls into his father’s habits, drinking excessively, when he comes across two thugs. 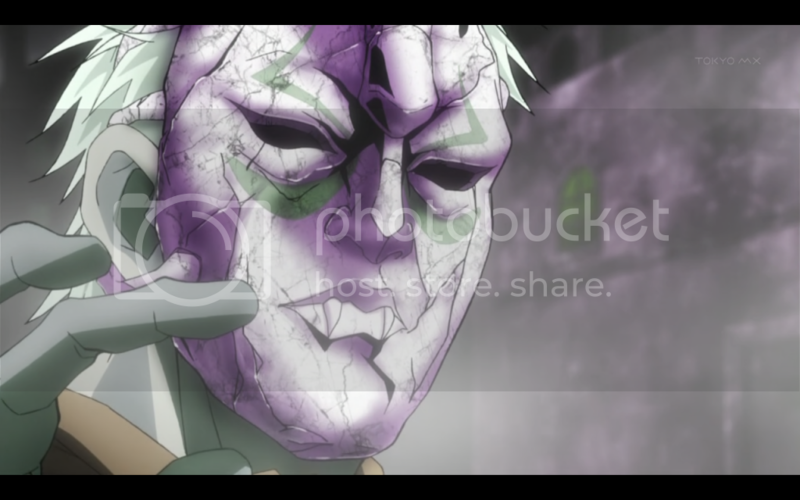 He beats them easily, and uses the mask he planned to murder Jojo with on one of the thugs. The mask apparently kills the man, but he rises, his face changed into a horrific shape. 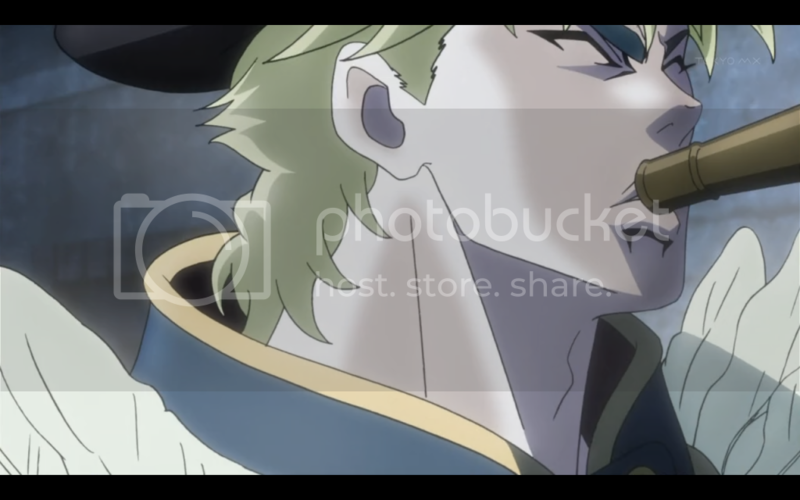 The thug penetrates Dio’s neck with his fingers, and starts drinking his blood. The only thing that saves Dio is the rising sun. I think there’s an important thing that needs to be pointed out. WHY ARE THEY FRIENDS!? 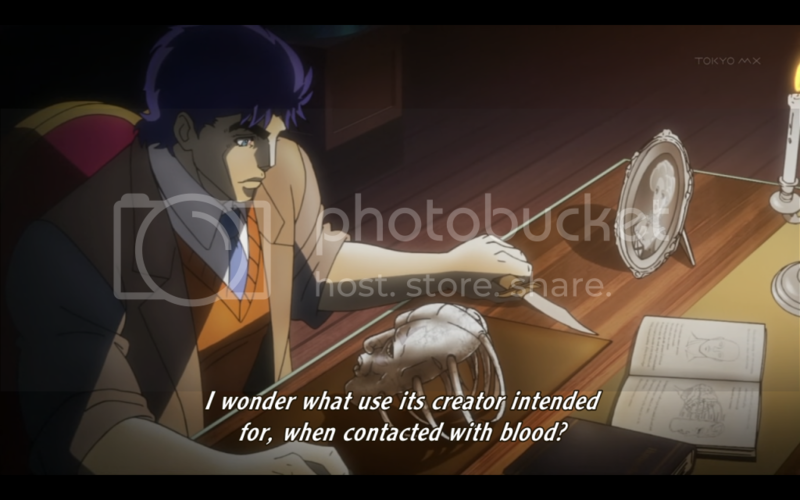 I know Jojo shows doubt as to whether they are really friends, but I think Dio’s actions seven years earlier very succinctly stated his intentions! That being said, this episode is a massive improvement over the first episode. I think a lot of people probably dropped the series thanks to the general unpleasantness of episode one, and if any of you are reading this, believe me, it’s safe to come back. The rest of the series will be more like this episode. The rugby match, while not a large part of the story, was a lot of fun. 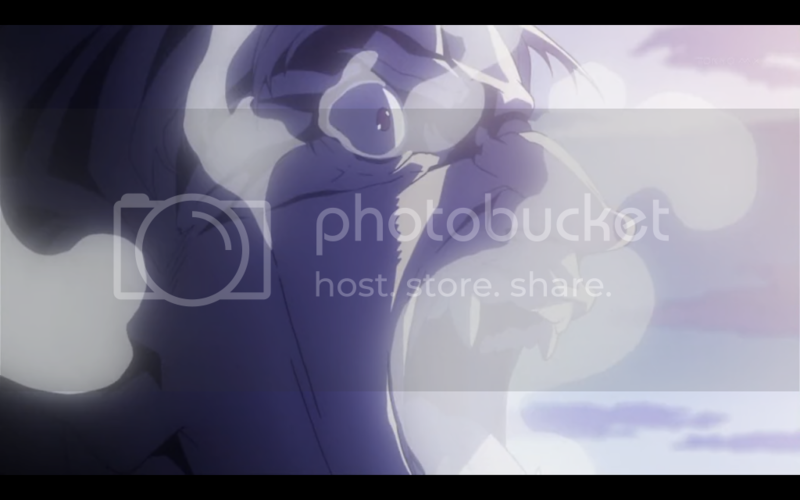 I liked how it was used to showcase Jojo and Dio’s abilities. 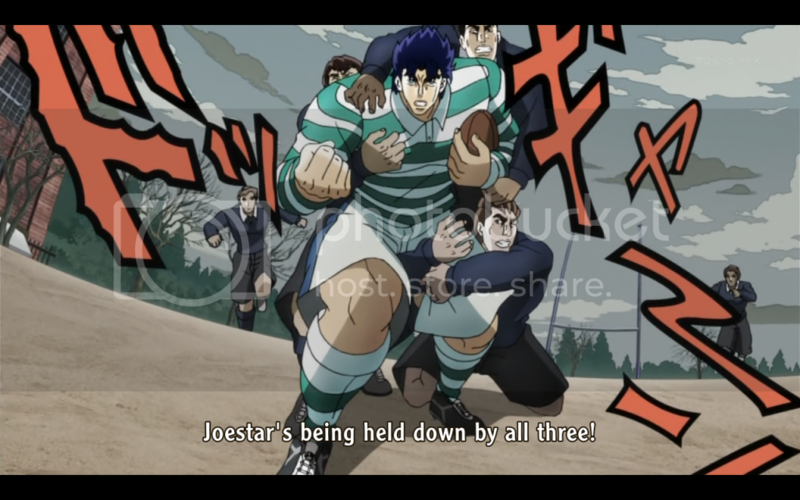 With Jojo being the tougher, stronger one, and Dio, despite being massive himself, being the faster. This makes me think of many classic examples where strength is portrayed as a noble aspect, while the weaker character is seen as the villain. Granted this does not work as well visually, since both are bulky, but for an example of what I’m talking about compare Mufasa and Scar, or Thor and Loki. Generally the bulkier, stronger looking character is seen as the more noble. This ties in further with how Dio has matured in his methods, using subterfuge rather than all out violence to get what he wants. His poisoning of George Joestar, and plan to make Jojo’s death look like an accident very much fit the classic archetype. The main thing that viewers not familiar with the manga will notice is that JoJo’s Bizarre Adventure has a very unique narrative style. Rather than focusing on the visual, character motivations are exposited during internal monologues. This is somewhat of an antiquated style, and may turn some viewers off. But the thing to keep in mind is that while the style may be old, it is not necessarily wrong. Nowadays this style of storytelling does not work, however, as a faithful adaptation of the original manga, certain outdated aspects need to be adopted as well. 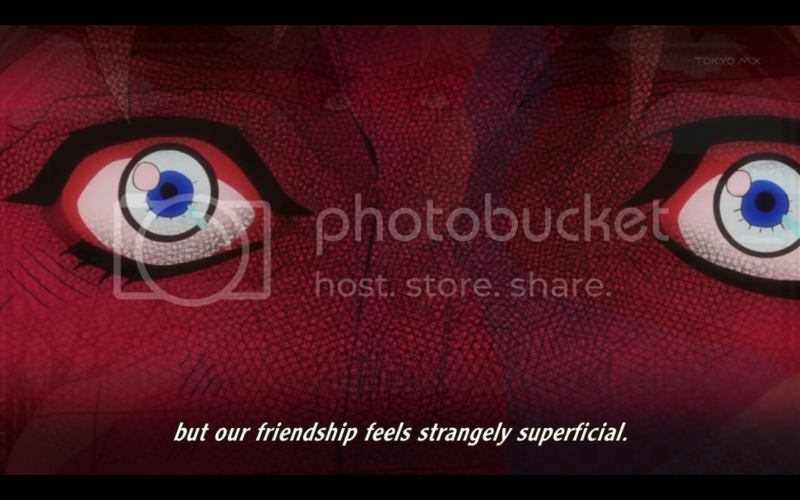 A good amount of the visuals are focused instead on being as flamboyant as possible. The characters pose in ways that nobody in their right mind would. My working theory is that their unnatural amount of muscles are limiting their range of movement in such ways that they can only stand with their backs angled at an unrealistic angle, their feet spread wide apart to keep what little balance they can. This episode improves greatly on the first, a lot of the elements new viewers might be turned off by are still there, but it does away with the general unpleasantness of the first episode. 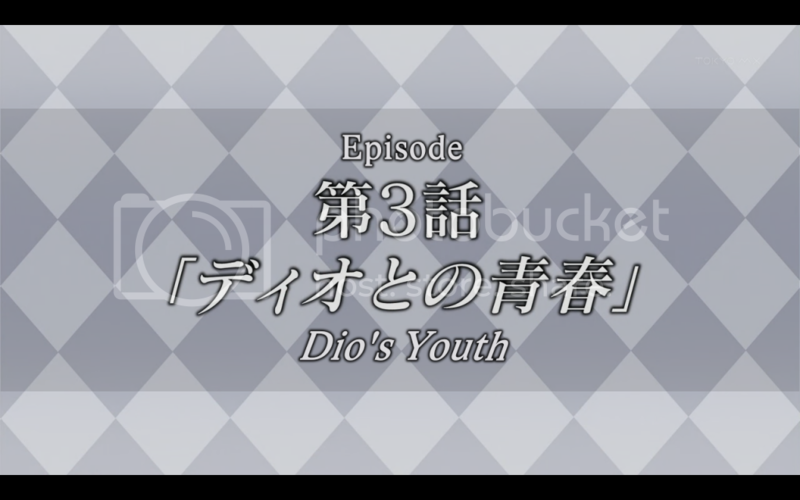 Jojo is no longer the simpering twit that he was in episode one, and his confrontation of Dio and general noble character help push this episode up a grade.